When you're chasing down prey on a hunt, the last thing you need is a weapon malfunction. Winchester knows this, and they've designed their Super X line to meet standards of quality you can rely on when you have your prey in your sights. When misfires are out of the question, Super X is there to ensure your time doesn't go wasted. 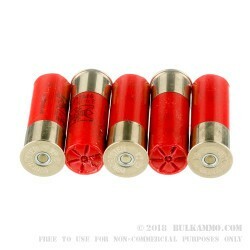 These 12 gauge 00 buck shells are perfect for taking down deer and other midsize game at close to mid range. 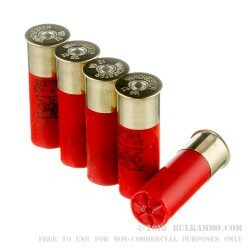 Their One-Piece Hinged Wads reduce felt recoil and their 209 primers provide reliable ignition with clean-burning powder. 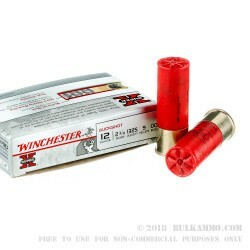 These shells create enough terminal energy for a humane kill when employed correctly, and are sure to provide desirable results thanks to Winchester's Super X quality standards. 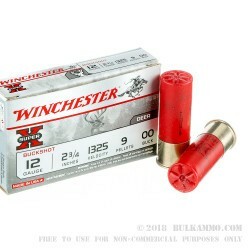 Winchester's 2 and 3/4 inch 12 gauge 00 Super X Buckshot fires nine lead pellets at 1,325 feet per second. The shells hull is made of red plastic with a brass base plate. They come packaged in five round cardstock boxes, with 50 boxes in this case.